Senator Pam Jochum and her daughter, Sarah. 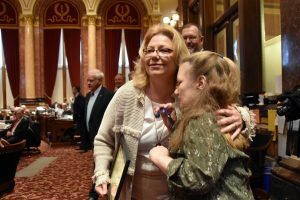 Senator Jochum, who has also served as president of the Senate, was joined by her daughter, Sarah, in the Iowa Senate chamber. It is my privilege to once again to present the Uncommon Public Service Award named in honor of a most “uncommon” American, Herbert Hoover. The Hoover Presidential Foundation established the Uncommon Public Service Award to be presented annually to one member of the Iowa House and one from the Iowa Senate who exemplify Herbert Hoover’s humanitarian efforts and commitment with uncommon service to the people of Iowa. Moments ago, Representative Dawn Pettengill received the award in the House. As you may recall, the 2017 Senate recipient was Senator Rob Hogg. Recipients become honorary members of the Hoover Presidential Foundation for one year and are also honored at the Foundation’s Celebration Banquet in the fall. President Hoover was an uncommon and extraordinary public servant. His diligent, humanitarian efforts saved the lives of millions of people suffering from the devastations or war, flood and famine, world-wide. Born in West Branch, in a humble one room cottage in Cedar County, in August of 1874, Hoover raised himself up to accomplish many great things. He won his first bid for elected office: the Presidency of the United States, and in his lifetime, saved the lives of well over a billion people in 57 countries. That certainly made him an “uncommon” person. Being “uncommon” is a quality of life and of service that we see often in our great state. We find uncommon people in our schools, churches, courts and hospitals, among other places. We even find them in our state government. And, that is why we are here today – to recognize an “uncommon” legislator from the Iowa State Senate. It’s greatly satisfying to me as a trustee of the Hoover Presidential Foundation, that for the 12th consecutive year, we’ve recognized legislators from the Iowa Senate who have demonstrated uncommon and extraordinary public service to the people of this state. I know that Mr. Hoover is here in spirit today as we present this award to State Senator Pam Jochum. Elected to the Iowa House in 1992 and then the Iowa Senate in 2008, Sen. Jochum is respected for her ability to build coalitions that get things done for Dubuque and Iowa. She was nominated by two former Uncommon Public Service Award recipients, Senators Rob Hogg and Amanda Ragan. 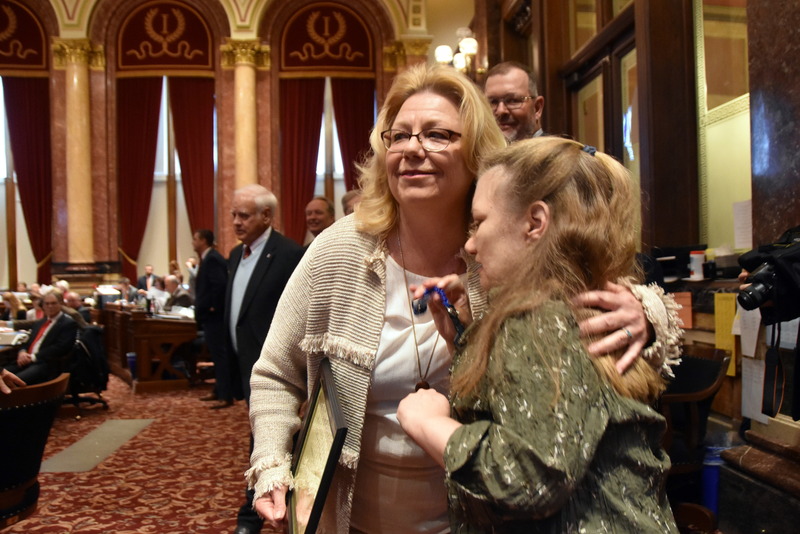 Among her many accomplishments, in addition to having served as president of this body, Senator Jochum has played a leading role in expanding affordable health insurance coverage to thousands of working Iowans and has stood up for citizens with disabilities to protect their health services. Her support for and commitment to education has been unwavering. She has worked to expand early childhood education and ensure affordable higher education, whether at a state university, a private college or a community college. Please join me once again in congratulating Senator Pam Jochum, the recipient of the Iowa Senate 2018 Herbert Hoover Uncommon Public Service Award!